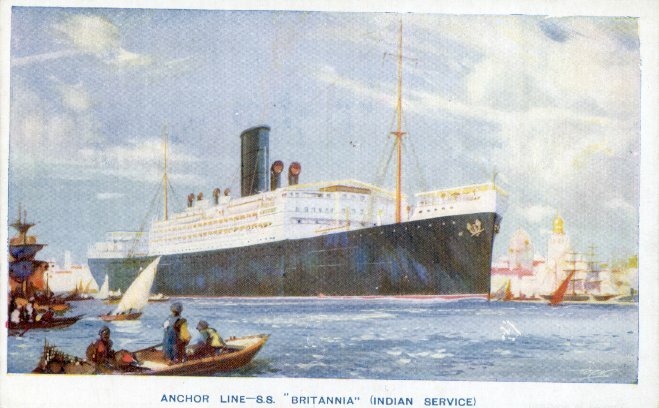 The ship shown here was Anchor Line's third Britannia. The first entered service in 1863 and was wrecked ten years later, while the second was in service from 1880 to 1908. This third Britannia was built by Alex. Stephen & Sons, at Linthouse. 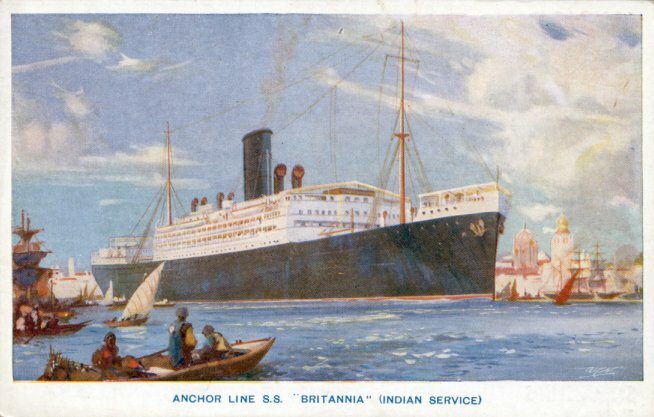 With accommodations only for 175 first-class passengers, Britannia made her maiden voyage on 3 March 1926, from Glasgow to Bombay via the Suez Canal. She remained on that route for her entire career with Anchor. That career ended on 25 March 1941, when Britannia (in service as an armed troopship) was intercepted 750 miles off Freetown by the German auxiliary cruiser Thor (ex-Oldenburg-Portuguese Line's Santa Cruz). After an hour-long battle, the outgunned Britannia was abandoned and eventually sank from the effects of Thor's continued shelling. Out of the 281 passengers and 203 crew members on board Britannia, 127 passengers and 122 crew were lost. Some of the survivors may have been captured by Thor, but one boat with 63 people was later picked up by the Spanish steamer Bachi, and another reached Brazil with 38 on board on 17 April.